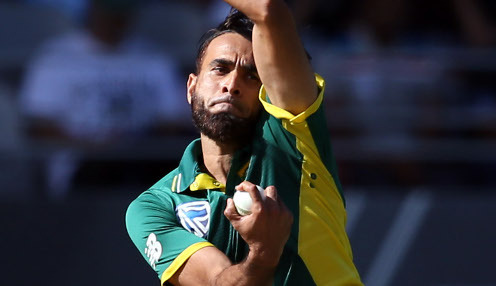 Imran Tahir is set to play in the first Test against Sri Lanka. South Africa coach Ottis Gibson says the tourists will consider playing two spinners in their first Test match in Sri Lanka. The Proteas won at Galle four years ago with JP Duminy's off-spin supporting leg-spinner Imran Tahir. However, this time they could select both Keshav Maharaj and Tabraiz Shamsi in their XI. "We have covered our bases with the team that we have picked. We have four quality fast bowlers and three quality spinners. We have to get to Galle and have a look at what the surface is going to be like," Gibson said. "We are confident that whichever combination we put out will be a strong one, one that can go and win us a Test. We will try and pick the best bowler for the conditions that we have. "If the conditions are going to favour spin, we will obviously try and get another spinner into the attack. "If it looks like it's going to be a good pitch and we feel that having extra pace will make a difference to the Sri Lankans. We will also consider that option. At the moment we are not sold on one way or the other, looking at the surface will go a long way towards us making a final decision." The first of two Tests start on Thursday, with the second one in Colombo the following week. South Africa are 8/5 to win the first Test while a Sri Lanka victory can be backed at 9/4.